Karl-Anthony Towns, a 20-year-old center/forward for the Minnesota Timberwolves, has proven he can take the heat on the basketball court. And it turns out the recently named NBA Rookie of the Year (and all-around good guy) can take the heat in the kitchen, too. 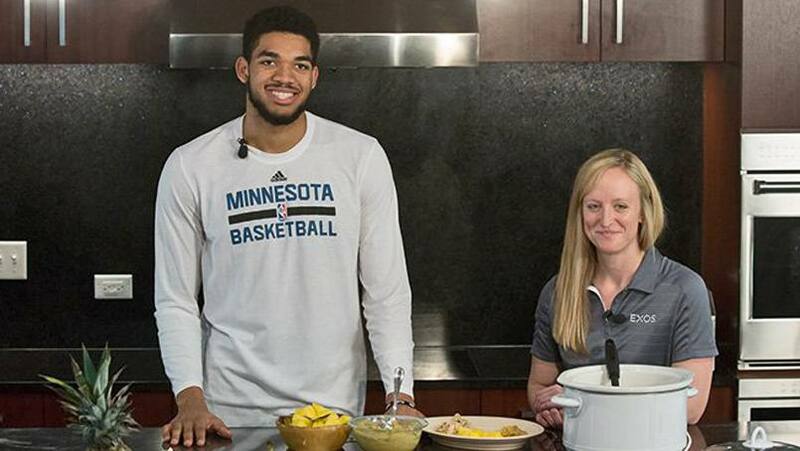 Towns loves to cook – especially Dominican foods, like those he grew up eating thanks to his mother. So he recently teamed up with Jill Merkel, an EXOS dietitian based at Mayo Clinic Sports Medicine, to learn how to make a healthy version of a Dominican recipe. A camera crew (and a certain Loop editor) were there at Mayo Clinic Square in Minneapolis to capture the demonstration. In the 4-minute video, Towns and Merkel show viewers how to prepare shredded pork and caramelized mashed plantains – the latter being one of Towns' favorite foods and, as he calls it, a "Mom special." Throughout the video, Merkel offers healthy cooking tips while Towns handles the food prep. While his knife skills earn an "awesome job" from Merkel, Towns rates them in the "not as good as my jump shot" category. (We'll give him a rim shot for that.) The video highlights Mayo's relationship with the Timberwolves and EXOS, and will be shared through a variety of digital and social media (including here on the In the Loop blog). Towns and Merkel discuss the important role healthy eating plays in optimizing athletic performance, whether you're an all-star or just want to eat like one. And you can learn more about that yourself by scheduling an appointment with Merkel. She and her colleagues offer one-on-one nutrition coaching sessions to create plans that help athletes of all levels increase performance, speed recovery and improve their overall health. It's just one of the many services offered by EXOS – "pioneers in human performance" – as part of the company's collaboration with Mayo Clinic Sports Medicine, which has locations in Rochester and the Twin Cities. The Twin Cities location is at Mayo Clinic Square in downtown Minneapolis, which also is home to the practice courts for the Minnesota Timberwolves and Lynx. Mayo Clinic is the preferred medical provider for both teams. And who knows? Perhaps someday Towns will be drafted by another Minnesota team. A medical team. Last year, Towns told the Bleacher Report that he "is determined to become a doctor 'when the basketball goes flat.'" That sounds like a pretty good second act to us. Watch the video below, and then hit us with your best shot by sharing a comment and sharing this story with others.